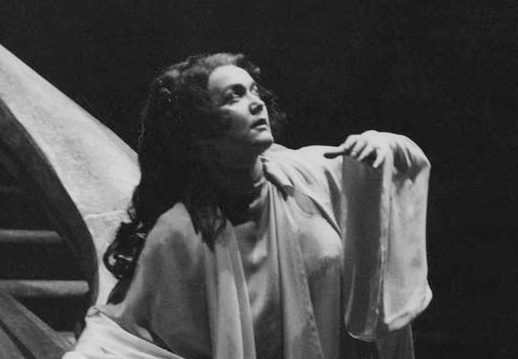 On this day in 1959 soprano Leonie Rysanek made her Metropolitan Opera debut as Lady Macbeth. . . . . Bing signed Maria Callas to create the role of Lady Macbeth at the Met, but, after a disagreement with that temperamental diva, replaced her with Leonie Rysanek. It has been Mme. Rysanek’s fate to substitute for Mme. Callas with other American organizations under similar circumstances. In our opinion, Bing and the Met subscribers got a break in this instance. At the dress rehearsal, Mme. Rysanek – due to the rigors of preparing for the assignment – gave but intermittent flashes of her powers. But these were enough to cause this reviewer to predict a triumph for her on [premiere] night. This, she had. In our book, Mme. Rysanek is the most distinguished addition to the Met’s roster since Renata Tebaldi. Few stars can match her for looks, and only a handful can act in the same league with her. As for her voice, it has a remarkable range. Forte or pianissimo, it is always under perfect control. Her lower register is rich. Her top notes soar above a chorus. She has amazing facility and flexibility. We found her the most exciting artist to reach the Met in many a semester. Frankly, we’ll take her any day in the week over Callas. She’s at home with Wagner or Verdi. Few others are. And she’s modest. . . .